After the amount of meat I have eaten in the last couple of weeks, I was craving a vegetarian dinner this weekend and whipped up this easy falafel sandwich recipe. My family just got back from a 2-week road trip to visit family up north. What do you do when you get a bazillion people together to eat in the summer? You fire up the grill. And my family is not known for grilling portobello mushrooms and veggie skewers. Nope. They are meat eaters and grilling means burgers, hot dogs, steaks and whatever other kinds of animal that can be cooked over an open flame. After two weeks of grilled meat, meat on pizza and big breakfasts with bacon I thought I needed a break from meat eating for a while. My husband and I have been looking up some vegetarian recipes to try out in the next couple of weeks until our arteries start flowing again! So, what is falafel? Falafel is a deep-fried ball or patty made from ground chickpeas. It is a traditional Middle Eastern food, commonly served in a pita. 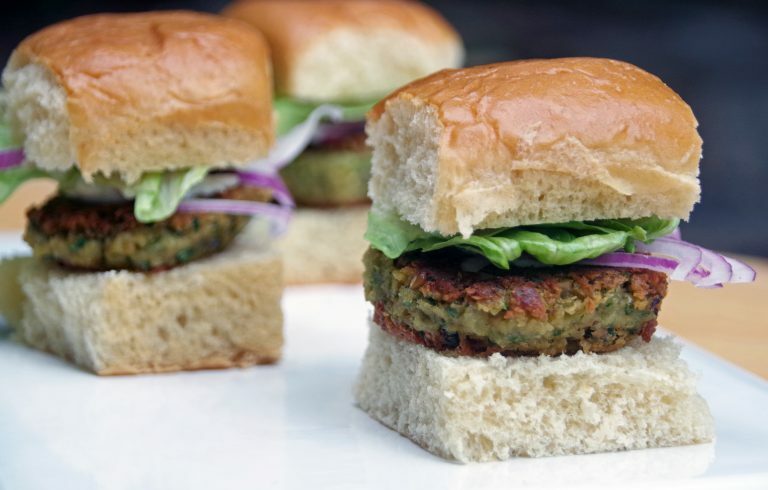 The predominant flavors are from cumin and curry powder and you can top your falafel sandwich recipe with an assortment of yogurt-based sauces. This falafel recipe is SO easy to make. You literally just toss everything into the food processor and turn it on. Process it until it is a course sand like texture and holds together when you make it into patties. 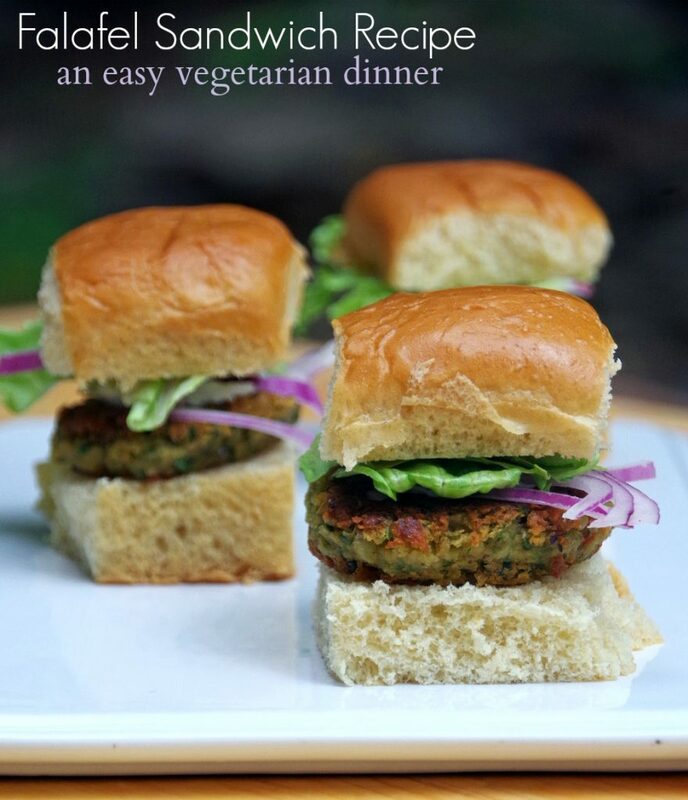 I fried them in olive oil and served them on tiny slider rolls and they were delicious! Just look at all those delicious ingredients! 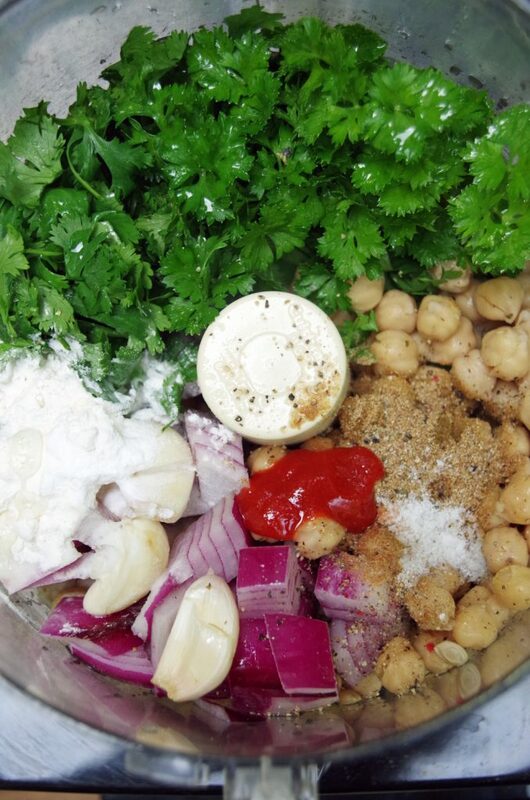 I used cans of chickpeas for this falafel recipe but I believe you can also use fava beans if you have those on hand. Some affiliate links for things that might come in handy when making homemade falafel: Rather than yogurt, many people use a sesame seed paste called tahini. You can add Tahini Sauce and Dip Spice to make it more flavorful. I was shocked to even find a Falafel Cooking Kit on Amazon which might make a nice gift for the foodie in your life. I encourage you to try out this falafel sandwich recipe the next time you are tired of meat and looking for a vegetarian dinner recipe! Place chick peas, cilantro, parsley, onion, garlic, spices, flour, baking soda, hot sauce and lemon juice in a food processor. You want to form medium sized balls in your hand and pack them rather firmly. Then press gently into a patty form. Place patties in the frying pan and cook until golden brown. Flip gently and continue cooking until the other side is done. Remove from pan and place on a plate with a paper towel to drain. To serve, place the patty on a slider roll with a dollop of Greek yogurt and some lettuce and red onion.